Arthritis in the hand is common, and occurs most often at the base of the thumb. Dr. Peter G. Fitzgibbons, MD at The Centers for Advanced Orthopaedics: Maryland Orthopedic Specialists Division performed fellowship-training in hand, wrist, and elbow surgery through the Harvard Hand & Upper Extremity Fellowship based at Brigham & Women’s Hospital in Boston. 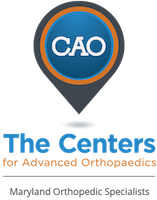 With office locations in both Germantown and Bethesda, Maryland, he and a team of orthopaedists, hand therapists, and physical therapists offer a comprehensive range of services covering the diagnosis and treatment of arthritis in the hand. Arthritis is pain and swelling in a joint, typically caused by loss of the cartilage that lines the joint. Osteoarthritis is the most common form, and while it causes is still not entirely understood, it is likely largely genetic in origin. Inflammatory arthritis, the most common being rheumatoid arthritis, usually has an underlying auto-immune component that can often be treated with medications. Where do people get hand arthritis? The most common joint in the hand, and in the whole body, that gets arthritis is the base of the thumb, down near the wrist. Arthritis also commonly happens finger joints at the end of the finger as well as in the middle one, rarely the joints at the base of the fingers. Most arthritis in the hand is manageable with a combination of splints, medications, and occasionally cortisone injections for a long period of time, often forever. When symptoms are not responding to conservative measures, Dr. Fitzgibbons will sometimes recommend surgical procedures to alleviate pain. These can involve fusing bones together so that the joints don’t move anymore, which works well in the joints at the end of the finger, or removing arthritic bones to take away the painful grinding of the joint (base of the thumb). What is surgery for hand arthritis like? Surgery for hand arthritis is usually an outpatient procedure and is usually, but not always, done with general anesthesia. Dr. Fitzgibbons performs most of these procedures at the Massachusetts Avenue Surgery Center, an outpatient surgery center that provides a safe, patient-oriented experience in a friendly and comfortable environment.